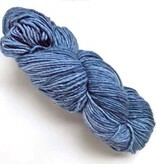 Malabrigo Worsted is a color lovers dream! The way this single ply aran weight wool takes to the kettle dye bath is amazing. Your finished cowls, hats, mittens, and sweaters will have a vibrant pop that only the colors of Malabrigo can deliver. This yarn requires hand wash, but if you’re into felting throw it into the washing machine because this yarn is a great option for super warm felted slippers and mittens.